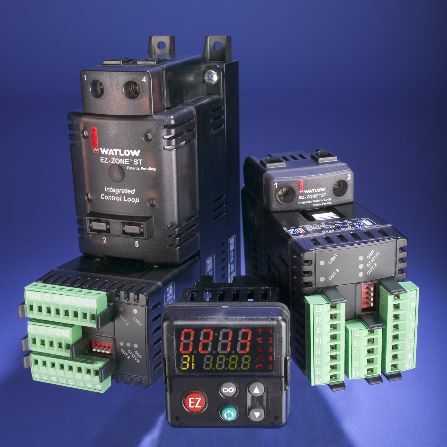 Used over a range of applications, automatically adjusting outputs based on sensor feedback. The F4T with INTUITION® temperature process controllerfrom Watlow® offers a wide range of field removable I/O modules for maximum design flexibility. Configurations can be custom tailored to meet the scaling needs of a tremendous range of equipment and applications while providing exactly the hardware types required for compatibility. The EZ-ZONE® ST integrated solid state controller offers a complete thermal system control solution in a single package. Features include a PID temperature controller connected to a high-amperage solid state relay with the option of adding a properly sized heat sink, an over- andunder-temperature limit, a power shut-down contactor and digital communications in one complete and professionally engineered product. The EZ-ZONE®PM panel mount controller offers control options that reduce system complexity and thermal loop ownership cost. It can be ordered as a PID controller, an over/under limit controller or its functions can be combined into an integrated controller. The EZ-ZONE PM Express panel mount controller is an industry-leading PID controller that allows optimal performance utilizing simple control and menu functionality without complex features. It is ideal for basic applications and usage levels. The SERIES EHG temperature control and sensor reduces system costs and lasts substantially longer than a conventional thermostat solution. The SERIES EHG® SL10 integrated, multi-function controller is a key component to a powerful system that integrates a heater, an adjustable set point temperature controller, a high/low temperature alert, a power switching device and a high temperature safety limit.